Salmon is great and whenever I make it, being it fresh or smoked, I always try to have some leftovers to make a nice sauce for a pasta dish. 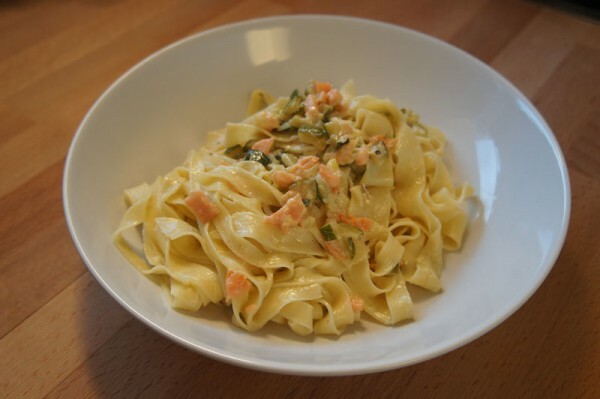 The usual sauce takes a minute to make, it is simply made of salmon, cream, a pinch of salt and black pepper (you can find it here: Salmon Linguine). The other night though, while I was craving a nice salmon sauce for the fresh tagliatelle I was making, I also felt like eating something fresh and summery. I improvised a sauce and it turned out great! I loved it! So here it is. 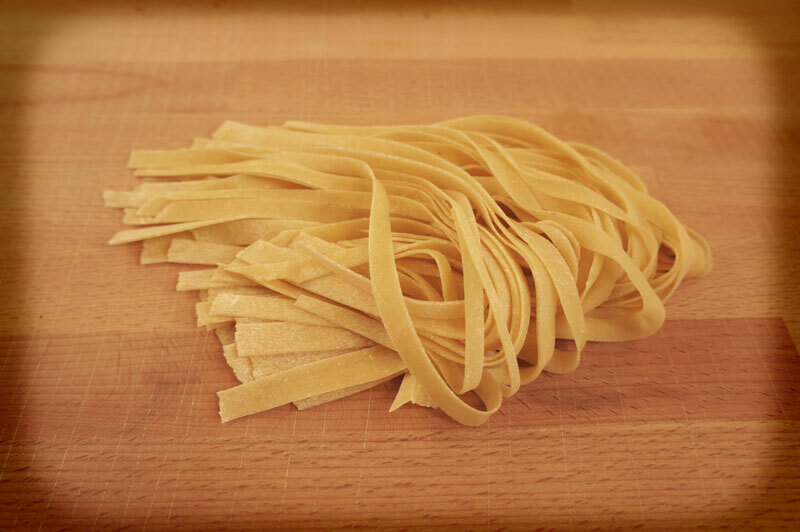 You can find the recipe for the fresh tagliatelle pasta here. The following portions make enough sauce for 2 persons. Cut the zucchini in small cubes, or thin slices. Heat the olive oil in a skillet, sauté the onion. Add the zucchini to the skillet, add a pinch of salt, add 1 tbs water. Cover and cook over medium heat stirring a few times for about 10 minutes or until the zucchini are tender. Mesh some of the zucchini, simply squish them with a wooden spoon or transfer them to a food processor. Add the smoked salmon cut in small pieces, and cook for a couple of minutes. Add the cream, black pepper to taste and stir everything together. Cook for a couple more minutes. 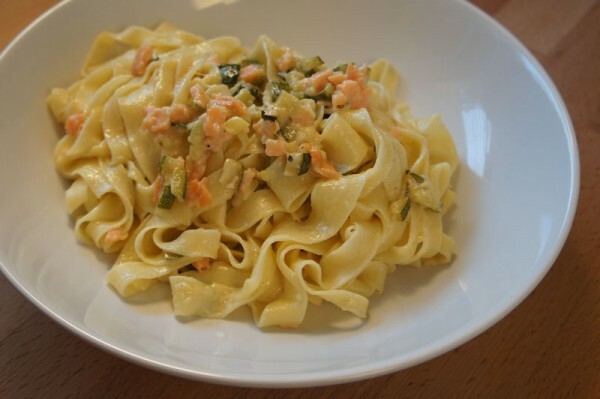 You could use cream cheese instead of heavy cream, but in this case remember to add some spoons of boiling water from the pasta to melt the cheese and obtain a nice creamy texture. 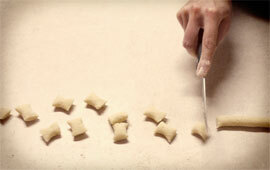 When the pasta is ready, drain and toss with the sause. Mix well and serve.